Pro-B Probiotic Feminine Supplement is specially formulated by doctors at the Canadian National Research and Development Center for Probiotics, over-the-counter. Pro-B, a feminine probiotic, is now available to women as a daily supplement to block and reduce yeast and bacteria to maintain healthy vaginal flora. Women can finally take control of their feminine health with a daily probiotic – a capsule taken orally like a vitamin. Although most people think of a probiotic for digestive health–now women in Canada will be able to purchase a breakthrough in probiotics that will block yeast and bacteria to maintain feminine health. 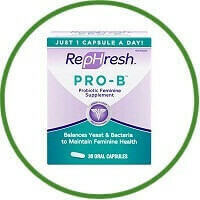 RepHresh Pro-B contains two patented and clinically tested vaginal strains of probiotic Lactobacillus, Lactobacillus rhamnosus GR-1(TM)and Lactobacillus reuteri RC.